It is constantly susceptible to pests and will probably never be completely bug-free. You can kill those pests with all kinds of harsh chemicals, but new ones will always show up later. And think of what those poisons will do to your flowers and plants (and potentially you) in the meantime. What's the right way to deal with bugs? Integrated pest management (IPM). That means rather than trying to exterminate 100% of them, you focus on long-term prevention and control through the use of multiple products. 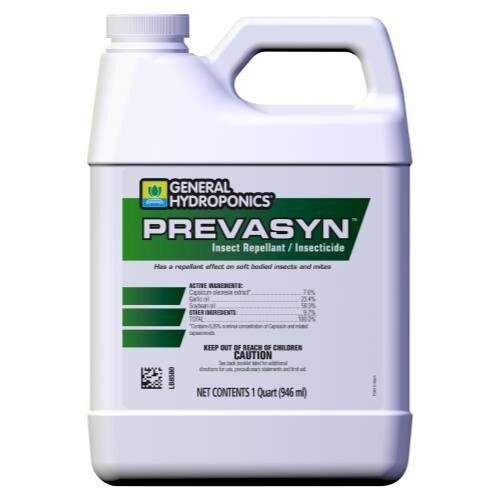 At General Hydroponics, Prevasyn is a big part of our all-natural IPM strategy. Prevasyn is an insect repellant that makes life miserable for bugs. It features a highly concentrated mix of natural oils and capsicum oleoresin (pepper extract). The latter ingredient is the key — soft-bodied insects and mites can't stand its agitating properties. When applied regularly, Prevasyn keeps bugs from eating, laying eggs on or otherwise inhabiting leaves. It also makes them more mobile, which increases perspiration and thus absorption of other pesticides (e.g. Exile). Prevasyn is one of the few insect repellants on the market that has both natural oils and capsicum oleoresin — and that you can trust to control your bug population naturally and safely.